To access third-party maps, request directions as you ordinarily would. 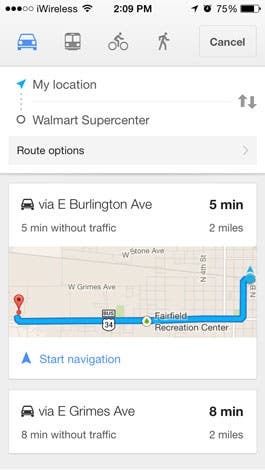 In the example below I asked Siri for directions to the local Walmart. As you can see, when Maps responds to the request with an overview, a route selection-menu appears at the top and offers three selections: Drive, Walk, and Apps. 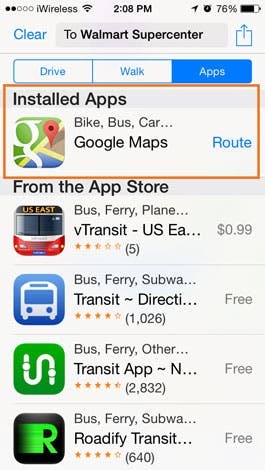 If you tap Apps, a menu will appear listing installed apps for mapping as well as apps in the App Store. Select the app of your choice, and your route will then be shown in that app, in this case Google Maps. 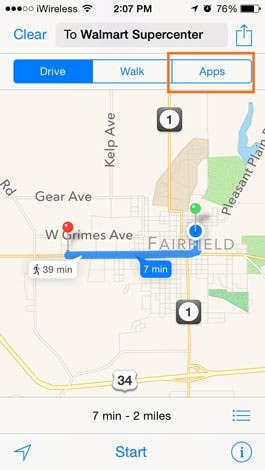 Note that Google Maps defaults to the Bus view, so you may want to change the view.